Someone once said: “A life without cupcakes is a life without love.” I agree. Everyone needs to learn a few cupcake hacks! Cupcakes are perfect, really. They’re tasty, they’re small—so you feel less guilty unless you happen to eat a baker’s dozen of them—they’re perfect little portals of happiness. Yes, I love cupcakes. Once you lick the frosting off, a cupcake is actually just a muffin. Muffins are healthy. So there’s that. I hear you though: healthy eating is important. So is a balanced diet. So put a cupcake in each hand. There… balanced. Not convinced yet? You will be: when I’m done sharing these cupcake hacks with you? You’ll love them too. Some people lick off the frosting and then eat the cake part (my kid). Some people tear off the top and eat it separately from the bottom. But that’s all wrong. The RIGHT way to eat a cupcake is to peel off the paper, gently pull off the bottom part and invert that back onto the top, with the frosting in the middle. So you have a cupcake sandwich, so to speak. It’s less messy and WAY more fun. Forget paper liners. You can get really fun by pouring your batter into flat bottomed ice cream cones. Bake them as usually would, let them cool and add icing for an ice cream cone cupcake that will delight! Want a heart shaped cupcake for Valentine’s Day? Line your muffin tin and add a marble or a ball of foil on the outside of each liner, but inside the tin. It will create that little divot that will shape the heart when baking. A cupcake with a surprise in the centre is a great alternative from the everyday (as if there was such a thing as an ‘everyday’ cupcake… but I digress…) Dig out your metal piping bag tips and insert a bigger one into the baked cupcake, from the top. Pull it out and you’ve got the perfect hole to fill with frosting, caramel, cream or whatever you want. You can cover it back up with a bit of the cake or simply ice over to finish! Don’t have time to make a fabulously rich icing? You can get away with an epic sweet topper by putting a large marshmallow on each cupcake, as they are baking. Wait until the cupcake has set, about 3 or 4 minutes before they’re finished, unless you want ‘marshmallow in the middle’ and not on the top. The result is a messy, sticky but delectable topping. You can even give the topping a s’more flavour by turning on the broiler at the end. In less than a minute, your marshmallow toppings will be toasty and lovely. How about a cupcake dip? If you top your cupcake bases with a light meringue frosting, rather than buttercream, you can refrigerate these to set them and then dip in melted chocolate. The resulting ‘dip’ goes back in the fridge to harden before serving! Swirl two flavours of frosting by filling two icing bags; one each of the flavours you want to use. Use one icing tip for both bags at the same time and voila: you’ve got a swirl! This one takes a little practice but the effect is so worth the effort. Do you have a favourite cupcake hack? Maybe a foolproof frosting technique that you can share? In the meantime, I’ll be over here sampling some… cakes. This looks real nice thanks for the tips ! I don’t really make cupcakes, but this is still helpful for future reference. I like eating cupcakes! 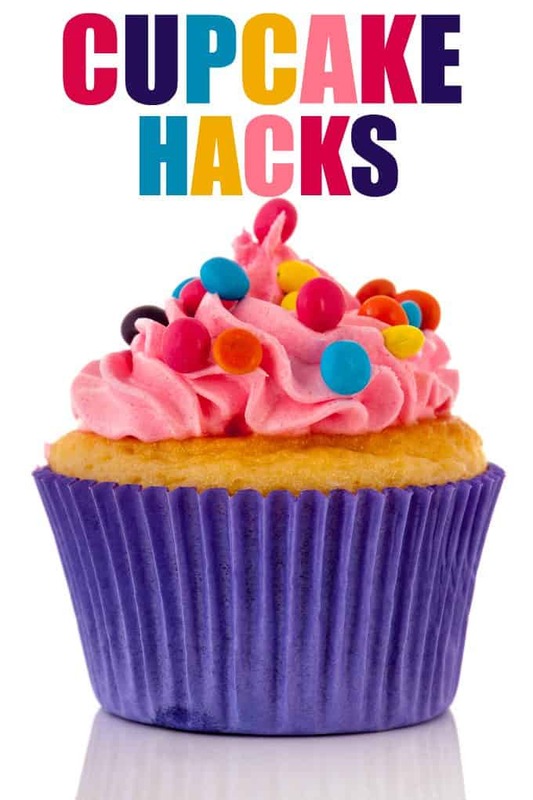 Some really great hacks, love making cupcakes! That swirl thing sounds so confusing. I think I’m just going to have to try it lol! I need to try doing the swirling of the icing!